If you have a weekend to spare then come and visit us in Aalborg. 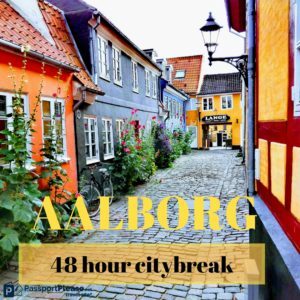 Aalborg is located almost at the top of Denmark but is easily accessible by train, bus and plane. There are direct flights from several of Europe’s major cities such as Amsterdam and London. From Copenhagen, there are more than 15 daily flights and the trip only takes about 30 minutes. If you travel by train from Copenhagen journey time is about 4 hours. 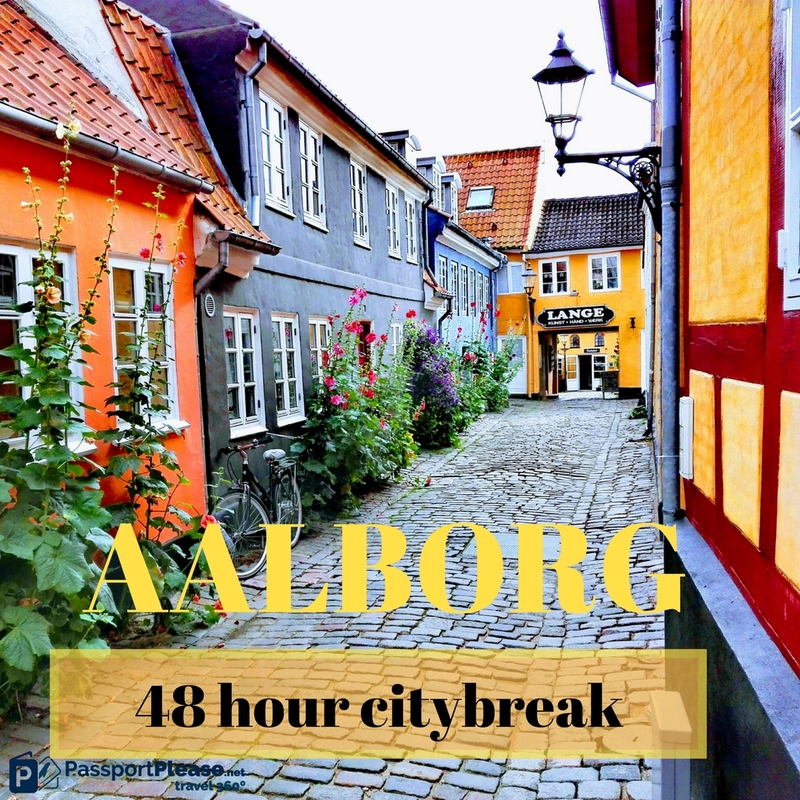 With the bus, travel time from Copenhagen is approximately 5 hours and the absolute cheapest way to get to Aalborg. Summer evening by the fjord. We have selected some of our favourite places, for you, to explore on a 48-hour visit to our city. 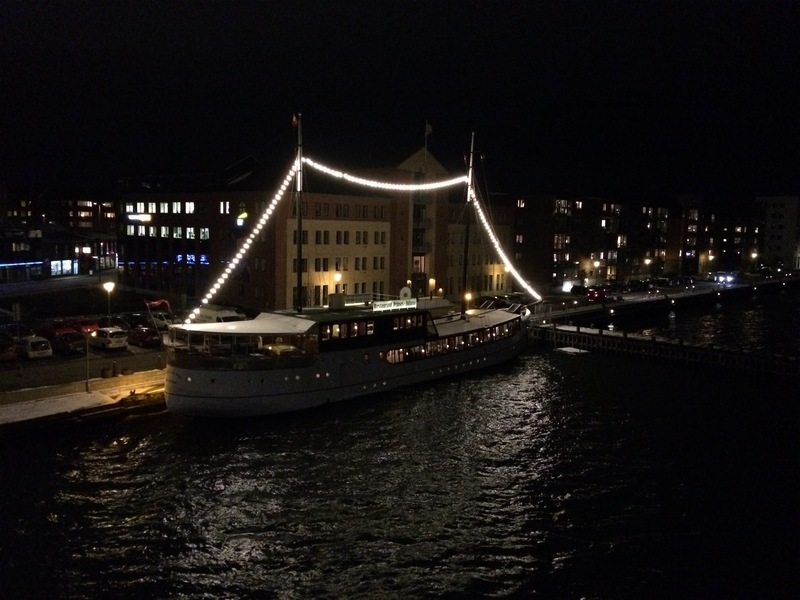 You can visit Aalborg summer and winter, there is always something to see and do. In this article, we will share some of our favourite things to do during a summer weekend. Once you have parked your luggage at your accommodation it’s time to wash off the dust of travel. 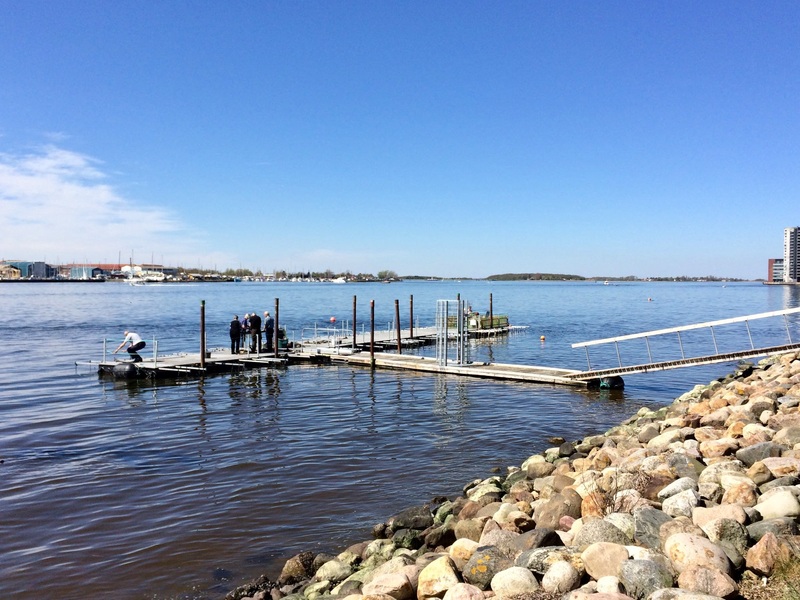 With Aalborg’s close proximity to the water, there are several options. 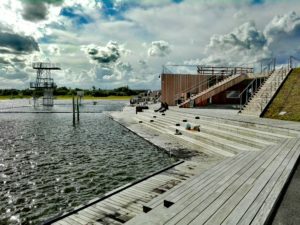 We suggest you either stroll along the waterfront or jump onto bus number 2 and head for Aalborg’s brand new Vester Fjordpark. 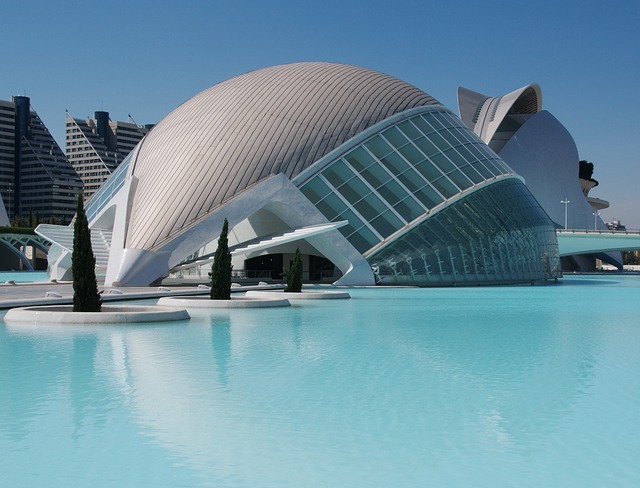 In this 165,000 square meters recreational park you have the best options for a refreshing dip. 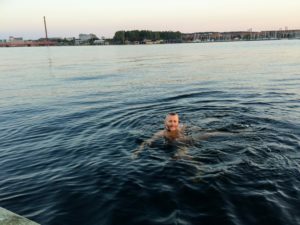 You can either jump directly into the Limfjord or splash around in one of the big pools filled with nice cool water taken from the fjord. From here you have a wonderful view of the small island of Egholm and towards the green hills of Nørresundby. Admission is free. 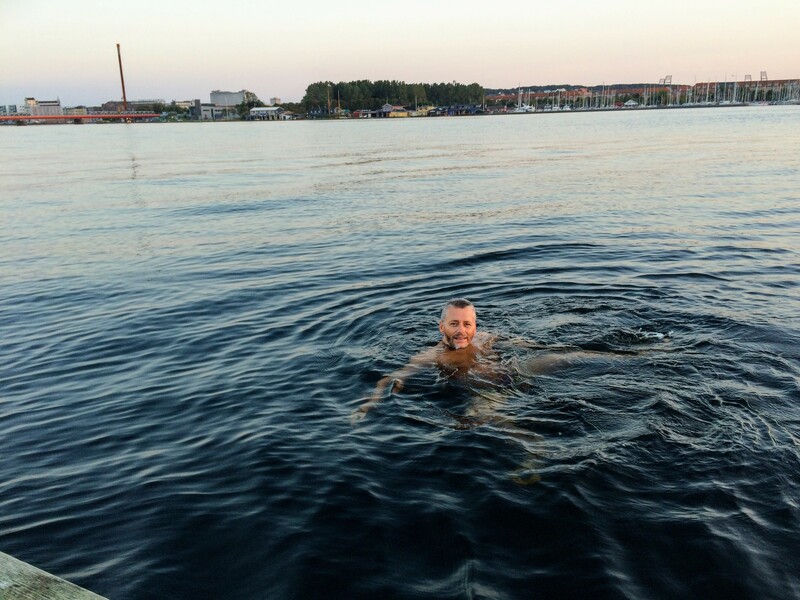 Water quality in Limfjorden is good but beware of the current that can get quite strong at times. 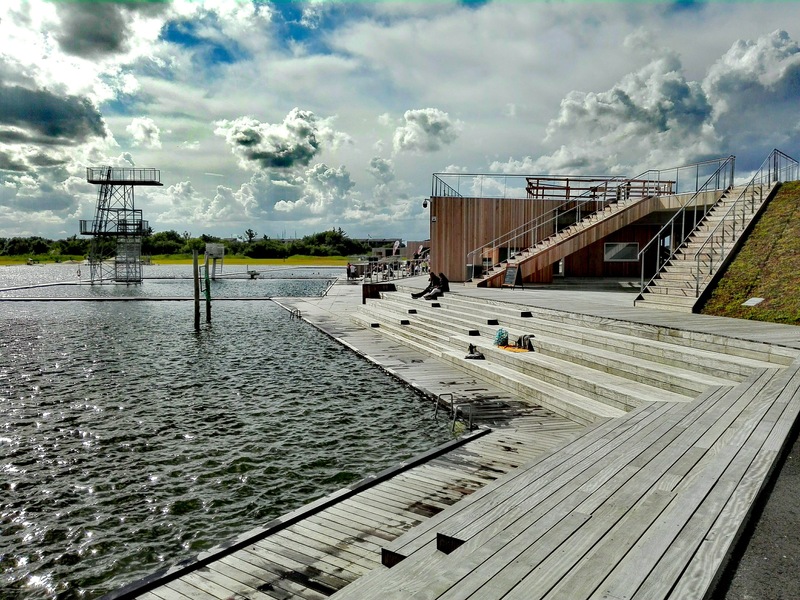 After your swim, you can either hang out in the park or you can head back towards Aalborg. 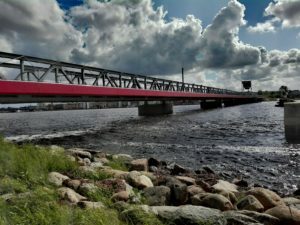 If you follow the waterfront back towards the center of town you will on your way pass by Kulturbroen, The Culture Bridge. A narrow walkway attached to the side of the railway bridge. When you have crossed the fjord you will, on your left-hand side see the Fjord Gardens. 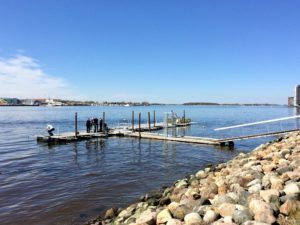 From a specially constructed pontoon floating on the water, locals grow their own mussels, oysters and seaweed. The idea of these water gardens is the idea of creating more opportunities for ” The good life ” in the cities around the fjord. Sustainable activities that do not require anything but commitment and interest, are keywords. 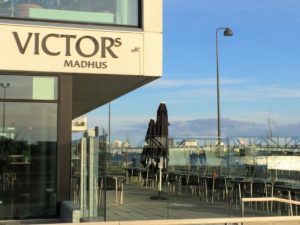 If you need to get refuelled on caffeine do visit Victors Madhus. With their large waterside terrace and the terrific view of the fjord, it’s a perfect spot for a coffee or maybe one of their delicious ice creams made by a local dairy. 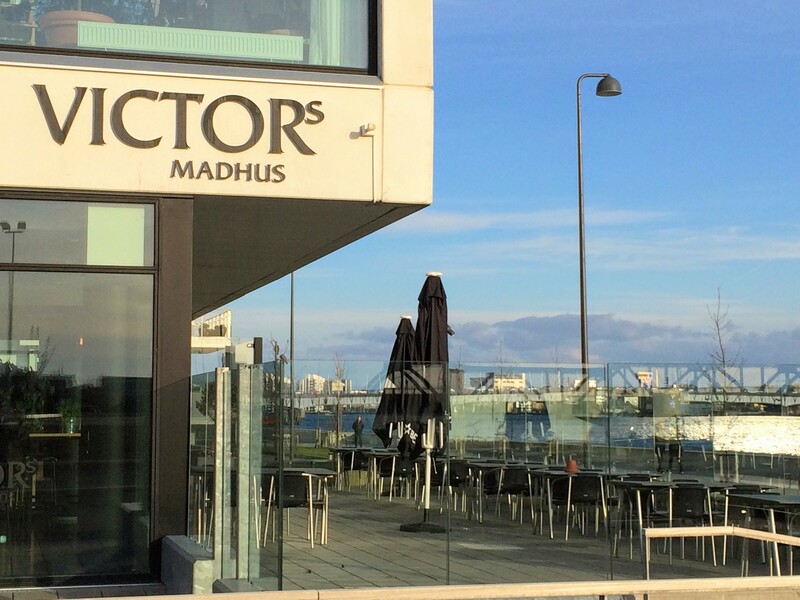 Victors Madhus is a perfect choice for good food at reasonable prices. The view from their terrasse is magnificent. 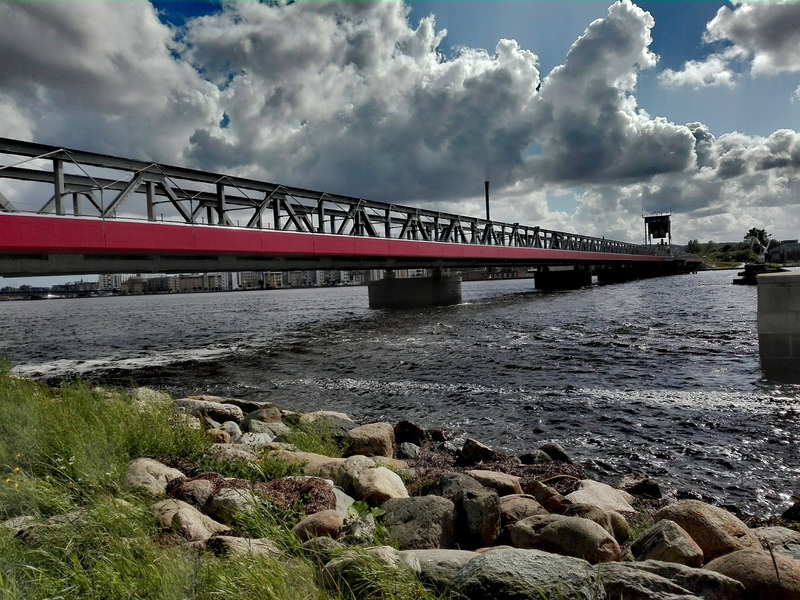 Continue along the waterfront to Limfjordsbroen where you can cross the fjord. Back in Aalborg, it’s time to taste some of the city’s really tasty locally brewed beer. Head for CW. 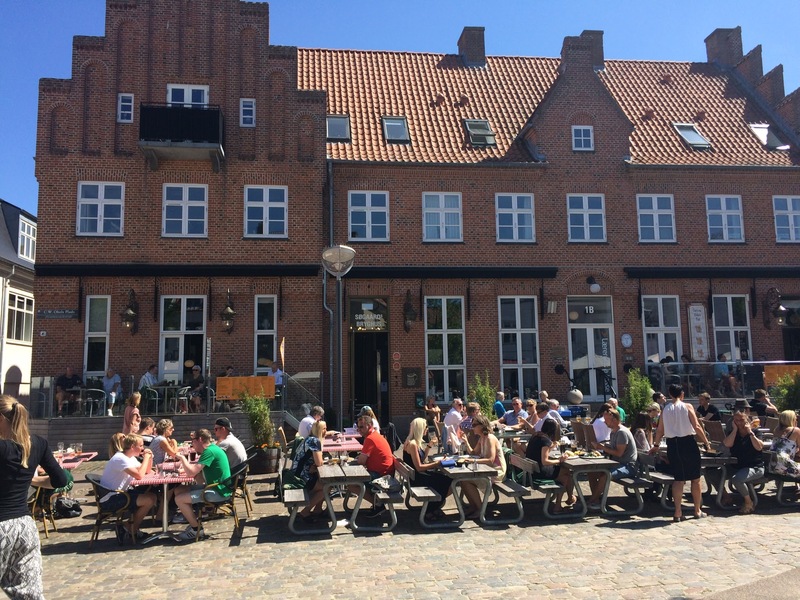 Obels Plads, a very cosy small square with a good atmosphere and lots of happy people. 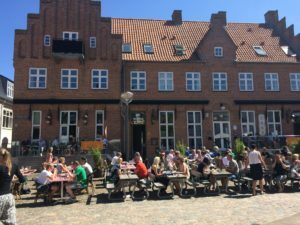 We recommend you to visit Søgaards Bryghus, a microbrewery where the master brewer brews seasonal beers. There are always about 24 different beer in the taps. Find your own favourites. 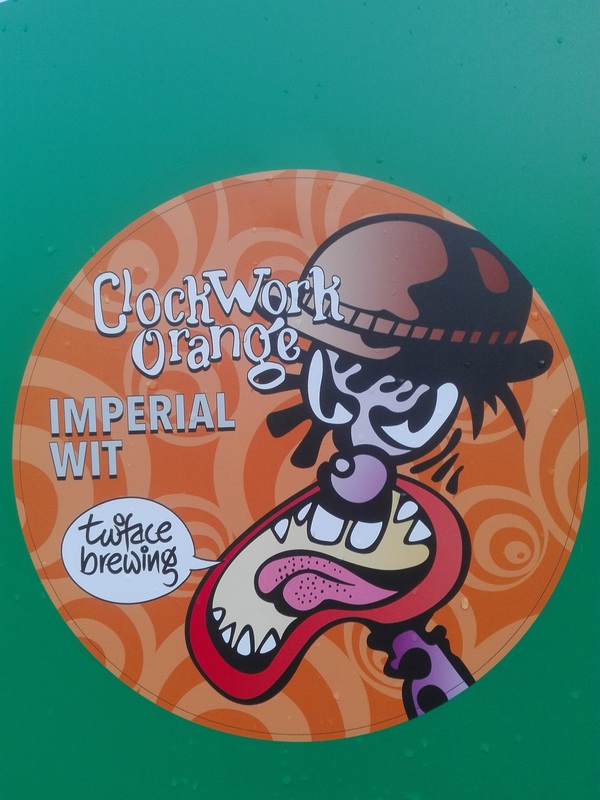 These days we drink their delicious “clockwork orange”, with great pleasure. Enjoy a hand-brewed ice cold beer at Søgaards Bryghus. After a beer or two, it’s probably getting time for dinner. 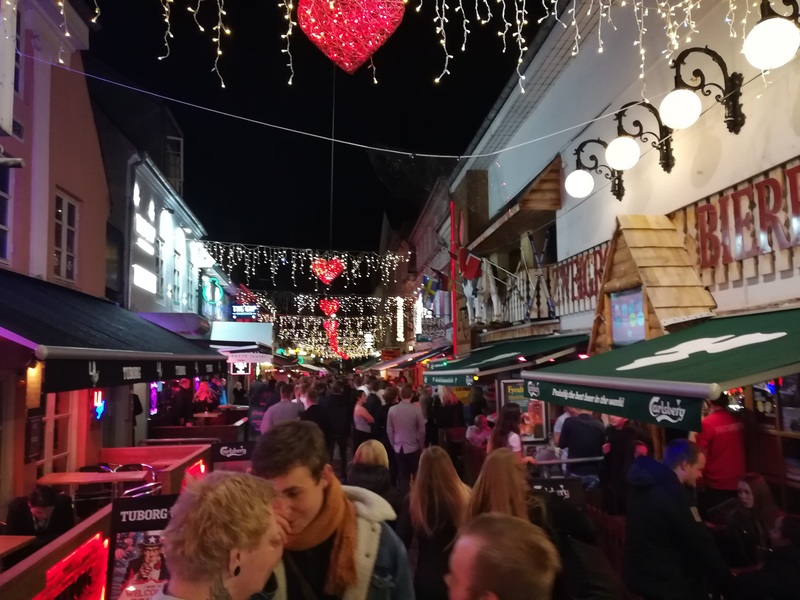 Aalborg has a vast selection of restaurants and the choice can be difficult but for your first night in town, we would recommend Restaurant Princess Juliana. Princess Juliana is originally a Dutch training ship constructed back in 1930 but today it has been transformed into a very lovely brasserie. Friday ends in the best way with a cocktail at Helmuth. Try their Filippa “ÆWLE”, we find this cocktail highly addictive. Saturday morning you should fuel up with a delicious breakfast at cafe Penny Lane, before heading out into the city. We consider Penny Lane to be one of the best cafes in town. It oozes atmosphere and coziness. You always get a good service and the food is of high quality and of course homemade. Their bread and cakes are organic and exceptionally tasty. Treat yourself to a brunch and if that doesn’t satisfy your hunger, keep on fueling with our absolute Penny favourite …….. a yummy ” Bedstemor bolle “, a Grandma bun . On Saturdays, Penny Lane opens at 8 am. 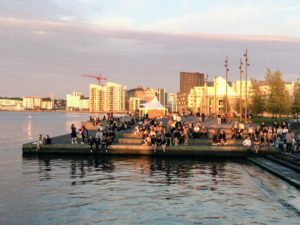 After breakfast, the next item on your Saturday program should be a long walk along the waterfront past the marina to “Fjordbyen” (The Fjord town) also known as “Skurbyen” (The Shed city). Fjordbyen is a unique part of Aalborg and you won’t find anything like it for miles and miles. The atmosphere is very special and soon you will feel that there is room for everyone here. Many of the houses in Fjordbyen resembles allotment houses but they are not nearly as groomed as in an ordinary allotment association. Here you are allowed pretty much anything when it comes to your house as long as your neighbours are happy. We are always surprised, when visiting, by the resident’s fantasy. In Fjordbyen you will meet all kinds of people. It is a motley and very complex circle of people who have a house here but it strikes you how everybody seems to get along. Helpfulness and social involvement seem great. The residents look out for each other. If you get thirsty, when visiting Fjordbyen, take a beer or a soda at “Kulturen”, the town tavern, but beware hysterical womenfolk do not have access ;-). They are used to visitors in Fjordbyen and they bid you welcome but do remember to respect their privacy. You can walk back to town or take the local bus. Bus number 2 will bring you back to Nytorv within 10 minutes. 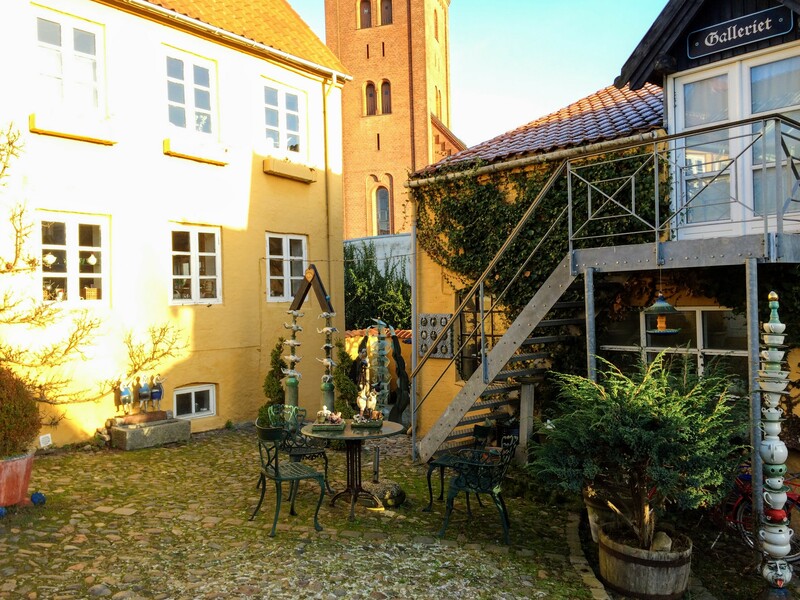 When back in central Aalborg take a stroll through Hjelmerstald, a part of the oldest Aalborg. Here you will find small empire houses up to 300 years old lying in a row. 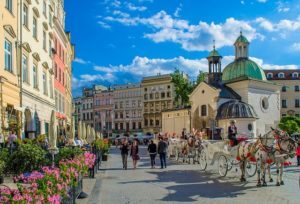 It’s a cozy and charming cobblestone street where you can sense the presence of history. Do also visit Langes Gaard. This small backyard belongs to a local potter who has decorated his charming courtyard with quirky and surprising works of art. 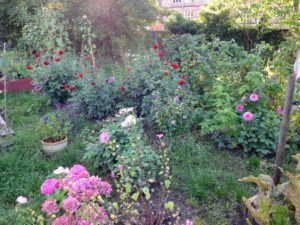 Visit Langes Gaard – the backyard of a pottery in central Aalborg. This quiet, charming and interesting place will put a smile on your face. 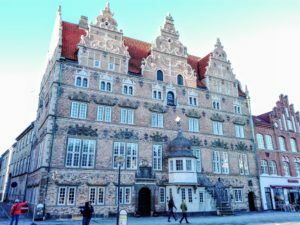 Before a late lunch, you will probably have time to visit ” Gråbrødrekloster Museet “. This fine little museum is located 3 meters below a busy pedestrian street and tells the story of an ancient Franciscan monastery and show findings from Aalborg’s Medieval past. Take the elevator down to the underground and be amazed. Price is 40dkk (cash) per elevator. 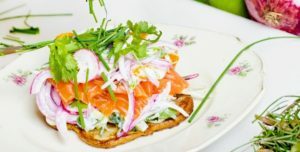 Now it’s time for lunch and when in Denmark you should try ” Smørrebrød “, our typical open faced sandwiches. The best place to eat smørrebrød has to be “Hos Isidor Henius”. This cozy little restaurant with red and white checkered tablecloths epitomises a Danish smørrebrød’s restaurant. Try their pan-fried fillet of plaice with shrimps and their roast beef with fried onions and eggs, two of our favourites. Draft beer and schnapps are mandatory. Schnapps is served in two sizes, normal and embarrassing. No need to say that the embarrassing one is a small serving . After lunch, a little exercise will do you good. Continue your walk around town with a stroll along the waterfront. Right next to the quayside you will find The Utzon Center. The Utzon Centre was created by the world-renowned Danish and Aalborg born architect Jørn Utzon and his son Kim. The centre was Jørn Utzon’s last work before his death in 2008. Photo: Flickr – Walter Johannesen. The very beautiful building houses an information centre for architecture, art and design. 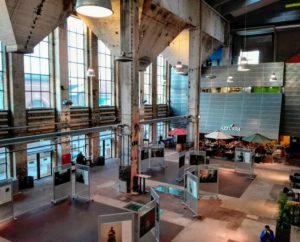 There is both a permanent exhibition and temporary exhibitions throughout the year. Further along the waterfront, you will find Musikkens Hus, House of Music. This beautiful futuristic architectural gem is the city’s new musical hub. You can admire the house from the outside but there is also free access to the building itself, and you should step inside! 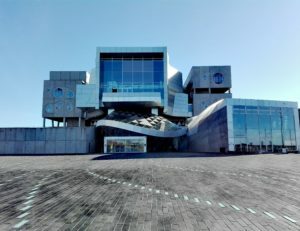 On the top floor there is access to a large balcony with beautiful views over the fjord and through large windows, you can get a view into the central and very impressive concert hall. 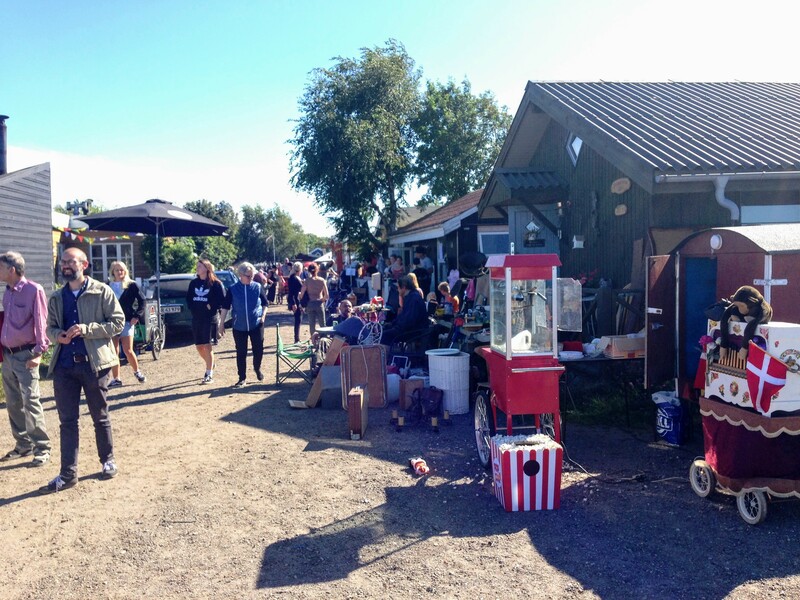 Across the street from Musikkens Hus, you will find Nordkraft. 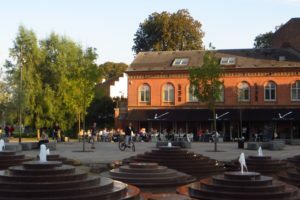 Nordkraft is the town’s main center for culture, sports, music and leisure activities. Nord Kraft is established in the city’s former power plant. The style is raw and you clearly sense the building’s former function. The main hall of Nordkraft, the former kettle hall. Take the elevator up to 13. floor and enjoy the view over the rooftops from the balcony. 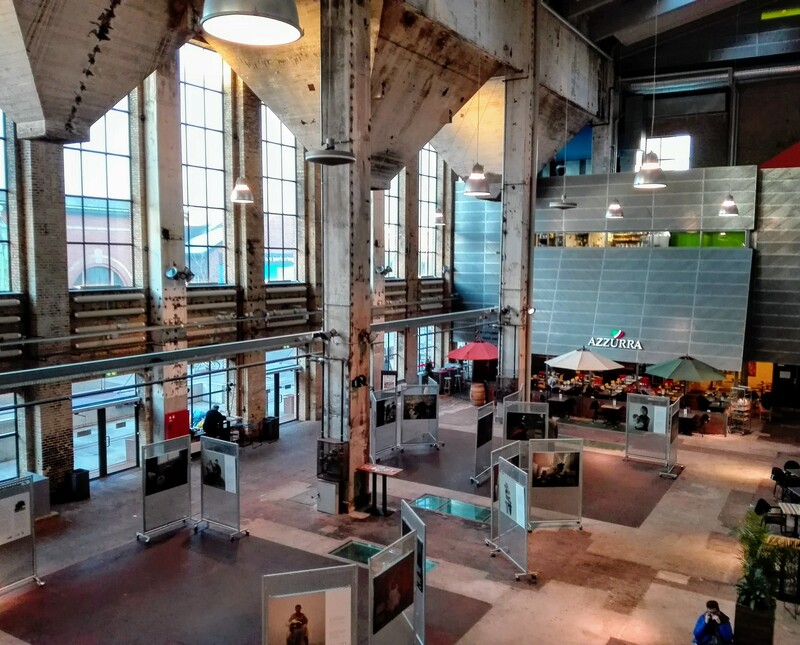 You can also visit Kunsthal Nord, an exhibition space for contemporary art, design and crafts. There is free access and they will even serve you a free cup of damn good coffee from their very special and unique coffee maker. Just on the other side of the street, you will find Karolinelund, one of the city’s largest parks. Karolinelund is a former amusement park but today the lawns are gathering space for us when we picnic, soak up the sun or play ball. At one end of the park, a group of locals have established an area of urban gardens. The urban gardeners have shown great imagination when it comes to the decor of the small plots. You can walk in between the small gardens and the gardeners are always ready for a chat about their different projects. At this time of day, a cold dip will do you good. Heading back towards the water you can stop at a local bakery and buy a few cakes and some takeaway coffee. Have a quick coffee break in Jomfru Ane Parken right next to Havnebadet, before jumping into the cool refreshing water. The harbour bath has a diving platform, various pools, sundeck, lifeguards and changing rooms. Admission is free of charge. After a nice cooling and a rest, it’s time for a before dinner drink. A glass of draft beer or a glass of wine at Duus is a good way to start a Saturday evening in Aalborg. Duus is housed in one of the city’s oldest houses, Jens Bangs Stenhus. In the basement, under ancient stone vaults, you will get a sense of history. 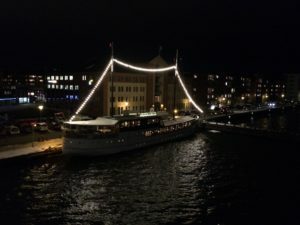 One of our favourite restaurants in the city has to be Bistro V.
A really good restaurant with a great atmosphere, outdoor seating and vistas towards the water. Their menu is incredibly delicious and you always get a friendly and highly professional service. It can be hard to choose from their menu because most of the dishes sound so delicious but we do, of course, have a couple of recommendations for you. One of our top favourites has to be Kongen, The King. A Burger so delicious it almost brings tears to your eyes. It’s served with a sauce that is made over 3 days and tastes like a spoonful of heaven. If you find The King to be on the heavy side try their tapas platter, also a very yummy choice. Another bonus feature to Bistro V is their Happy-Hour on weekend nights. From 21-01 you get double up on cocktails and beer. Another great place in town for Happy-Hour during the weekend is Vesterå cafe and nightclub. They serve tasty cocktails, Happy-Hour runs between 22.00 and 01.00 Friday and Saturday night. If your body is still bursting with energy and you want to burn it on the dance floor then proceed to Jomfru Ane Gade and groove on. Jomfru Ane Gade is Scandinavia’s largest party street and in this well known and notorious minefield of bars and discos, you can party until sunrise. After your batteries have been recharged with coffee and energising food it’s time for a stroll down Boulevarden to Kildeparken. Kildeparken is one of Aalborg’s oldest parks. In this beautiful urban park, there are fountains and works of famous sculptors. You will also find ” De syngende træer “, The Singing Trees. Since 1987, more than 80 internationally renowned artists have planted a tree when they have performed in the nearby convention centre. Beside each tree is a small speaker, at the touch of a button it plays a medley of the artist’s most famous tunes. 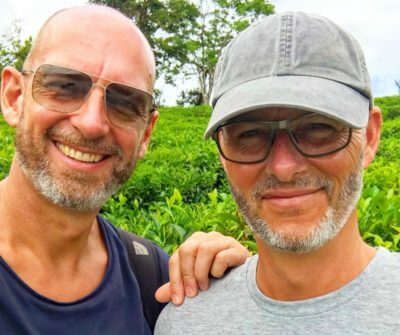 Sting, Stevie Wonder and Elton John are among the artists who have planted a tree here. 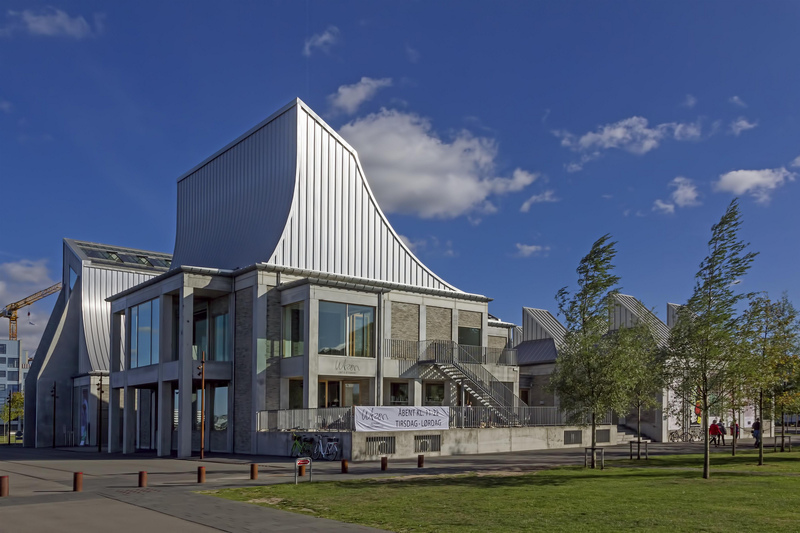 Close to Kildeparken, you will find Kunsten, Aalborg’s beautiful museum of modern art. 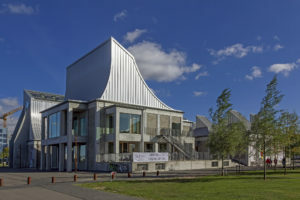 The museum was designed by Alvar Aalto and his wife Elissa. It’s a beautiful modernist building in white marble with window sections creating a unique light. Kunsten is the only building designed by Alvar Alto built outside Finland. 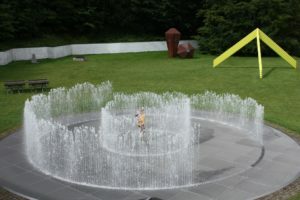 It has a wonderful permanent exhibition and every year several special exhibitions are held in the beautiful showrooms. You can easily spend hours here. Your Aalborg weekend has almost come to an end but before you leave, you have to see the city from above. Next to Kunsten, you will find Aalborg Tårnet, Aalborg Tower. This steel construction was erected in 1933 and has a viewing platform, 105 meters above sea level. It gives you a fantastic 360-degree view of the city and in clear weather all the way to the sea. 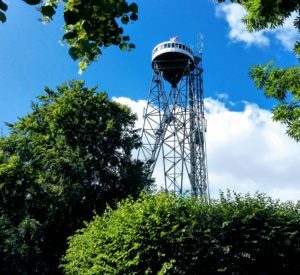 Northern Europe’s longest outdoor elevator brings you to the top in a few seconds. The tower has a small snack bar so while enjoying the view, you can also enjoy your lunch. Aalborg has a lot to offer. We have tried to give our take on a weekend in our hometown. We hope it has aroused your curiosity and maybe one day in the near future we can welcome you here with us. Friday (Blue), Saturday (red), Sunday (green). 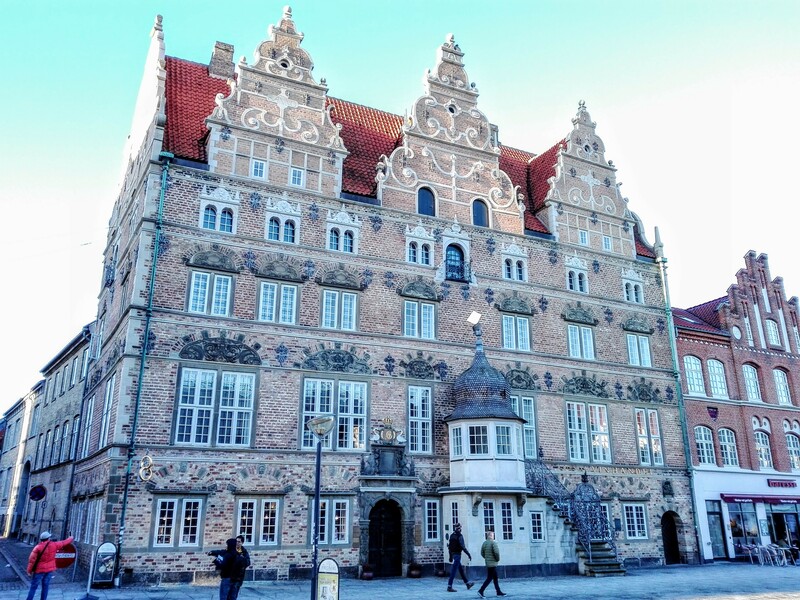 I really enjoyed reading your post about Aalborg! I lived there in 2003-2004, I was on a year work visa after college. My husband and I met at John Bull pub! We go back to Denmark about every other year to visit family, and were just there this past Christmas. It’s my home away from home! Thank you so much. 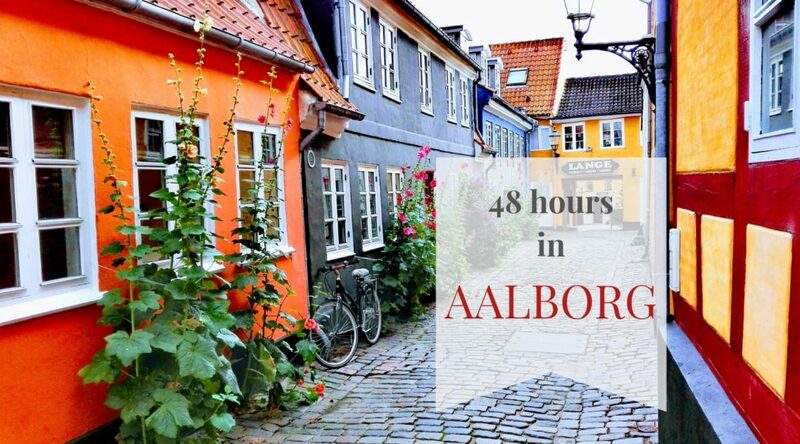 We are happy to have provided you with useful information about Aalborg. These years more and more cruise ships are visiting our beautiful hometown. Keep an eye on our blog, we will continue posting articles about Aalborg. If you have any additional questions or requests, please feel free to contact us. We will look forward welcoming you and your guests from Fred Olsen’s Braemar in May.